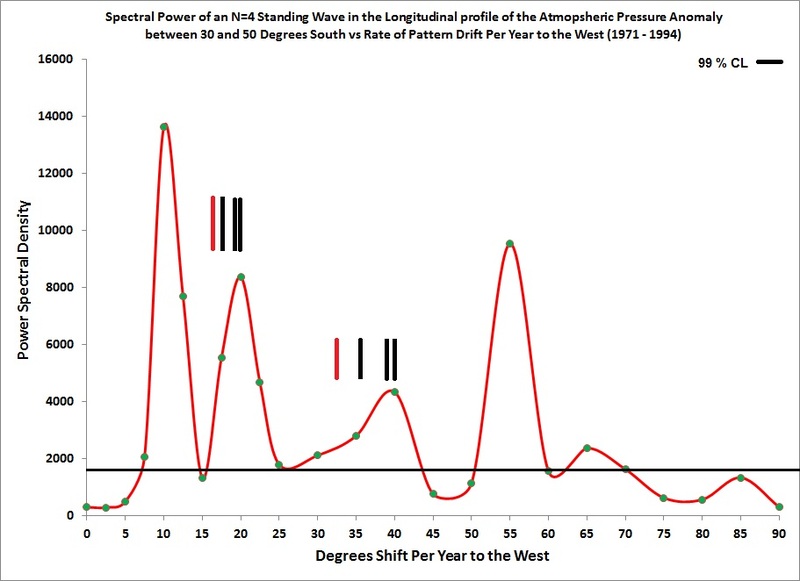 The longitudinal shift-and-add method is used to show that there are N=4 standing wave-like patterns in the summer (DJF) mean sea level pressure (MSLP) and sea-surface temperature (SST) anomaly maps of the Southern Hemisphere between 1947 and 1994. The patterns in the MSLP anomaly maps circumnavigate the Earth in 36, 18, and 9 years. This indicates that they are associated with the long-term lunar atmospheric tides that are either being driven by the 18.0 year Saros cycle or the 18.6 year lunar Draconic cycle. In contrast, the N=4 standing wave-like patterns in the SST anomaly maps circumnavigate the Earth once every 36, 18 and 9 years between 1947 and 1970 but then start circumnavigating the Earth once every 20.6 or 10.3 years between 1971 and 1994. The latter circumnavigation times indicate that they are being driven by the lunar Perigee-Syzygy tidal cycle. 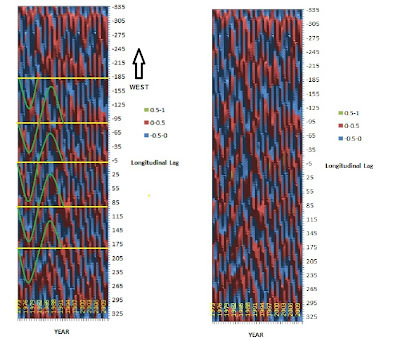 It is proposed that the different drift rates for the patterns seen in the MSLP and SST anomaly maps between 1971 and 1994 are the result of a reinforcement of the lunar Draconic cycle by the lunar Perigee-Syzygy cycle at the time of Perihelion. It is claimed that this reinforcement is part of a 31/62/93/186 year lunar tidal cycle that produces variations on time scales of 9.3 and 93 years. Finally, an N=4 standing wave-like pattern in the MSLP that circumnavigates the Southern Hemisphere every 18.6 years will naturally produce large extended regions of abnormal atmospheric pressure passing over the semi-permanent South Pacific sub-tropical high roughly once every ~ 4.5 years. These moving regions of higher/lower than normal atmospheric pressure will increase/decrease the MSLP of this semi-permanent high pressure system, temporarily increasing/reducing the strength of the East-Pacific trade winds. This may led to conditions that preferentially favor the onset of La Nina/El Nino events. In English: What are the main results of this paper? The NOAA SST anomaly map for the 25th of January 1981. Available at: ftp://public.sos.noaa.gov/oceans/SST_1980-1999/2048_rolled/cyl_1981_01_25.jpg [Accessed: September 2012]. 1. There are four large region of enhanced/reduced MSLP in the Southern Hemisphere, that are separated from each other by ~ 90 degrees in longitude that are slowly moving around the Earth in a retrograde (Westerly) direction, roughly once every 18.6 years. 2. These large features are part of a huge standing wave-like pattern in the atmosphere that is propagating in a westerly direction along the southern edge of the summer Sub-Tropical High Pressure Ridge. 3. This pattern is formed by atmospheric lunar tides that are being driven by the 18.6 year Lunar Draconic cycle. 4. Roughly once every 4.65 (=18.6/4) years, the four large regions of enhanced/reduced MSLP simultaneously pass over the top of the four semi-permanent high pressure systems embedded in the summer Sub-Tropical High Pressure Ridge (their rough locations are marked by the symbol "H" in the figure above). 5. When this happens, if the four propagating regions have an enhanced MSLP, they will produce a temporary increase in the MSLPs of the four fixed semi-permanent high pressure systems. This naturally leads to enhanced warm northerly winds on the western sides of the semi-permanent highs that would produce regions of warmer-than-normal SSTs, and cooler southerly winds on the eastern sides of the semi-permanent highs that would naturally produce regions of cooler-than-normal SSTs. This is exactly what is observed in the figure above. 1. During the first climate epoch between 1947 and 1970, the pressure of the four extended propagating regions of MSLP were predominantly higher-than-normal. 2. During the second climate epoch between 1971 and 1994, the pressure of the four extended propagating regions of MSLP were predominantly lower-than-normal. 3. 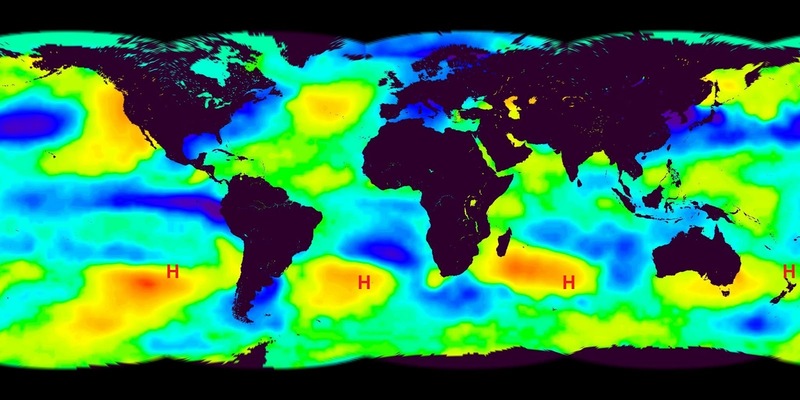 Hence, roughly once every 4.65 years during the first climate epoch, the four main regions of enhanced atmospheric pressure passed over the four large semi-permanent high pressure systems in the summer sub-tropical high pressure ridge. When this occurred, a large moving region of enhanced atmospheric pressure increased the pressure of the South Pacific sub-tropical high hovering over Easter Island, causing a temporary strengthening of the East-Pacific Trade Winds. This could have led to conditions that favor the onset of La Nina events over El Nino events throughout the first climate. 4. Hence, roughly once every 4.65 years during the second climate epoch, the four main regions of reduced atmospheric pressure passed over the four large semi-permanent high pressure systems in the summer sub-tropical high pressure ridge. When this occurred, a large moving region of reduced atmospheric pressure decreased the pressure of the South Pacific sub-tropical high hovering over Easter Island, causing a temporary reduction in the strength of the East-Pacific trade winds. This could have led to conditions that favor the onset of El Nino events over La Nina events throughout the second climate. A mutual reinforcement of the lunar Draconic cycle seen in the atmospheric tides and the lunar Perigee-Syzygy cycle seen in the SSTs . 1. 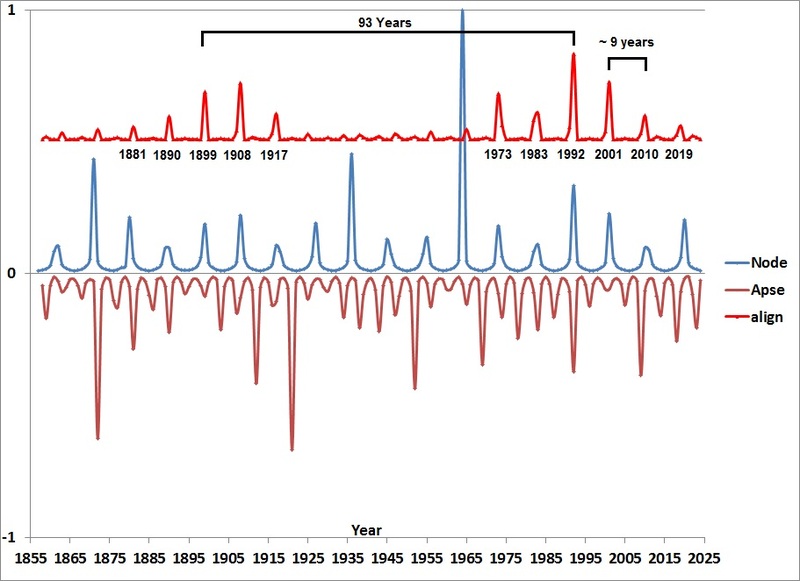 In the second climate epoch (from 1970 to 1994) there are N=4 patterns in the MSLP anomaly profiles that have circumnavigation times that closely match the lengths of the 18.03 (tropical) year lunar Saros cycle or the 18.60 (tropical) year lunar draconic cycle. In addition, there are N=4 patterns in the SST anomaly profiles that have circumnavigation times that closely match the 20.294 (tropical) year Perigee-Syzygy lunar cycle. 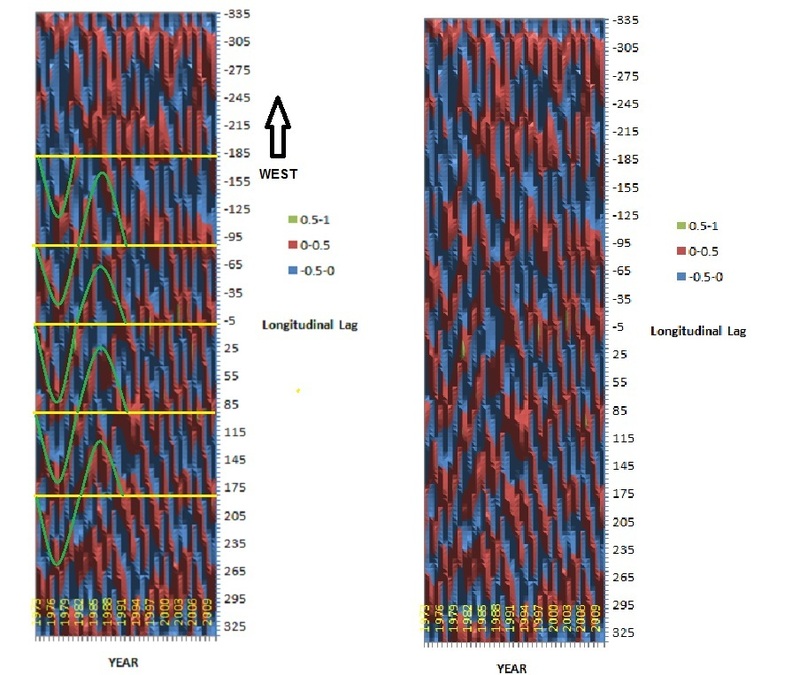 The fact that standing wave-like patterns in the MSLP anomalies and the SST anomalies are moving around the Earth at different rates and that the moving patterns in the MSLP anomalies appear around 1971 and then disappear roughly 24 years later around 1994, indicate that both patterns may only become visible because of a process of mutual pattern reinforcement. 2. Hence, the observational evidence suggests that we are seeing a process that is result of a mutual reinforcement of the lunar Draconic cycle seen in the atmospheric tides and the lunar Perigee-Syzygy cycle seen in the SSTs . 3. 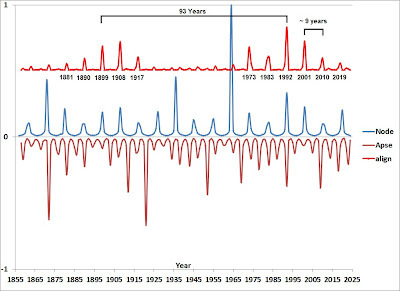 In the first climate epoch (from 1947 to 1970) there are N=4 patterns in both the MSLP and SST anomaly profiles that have circumnavigation times that closely match the length of the 18.60 year lunar Draconic cycle. There is no evidence of patterns in the SST that have circumnavigation times that match the length of the Perigee-Syzygy cycle. 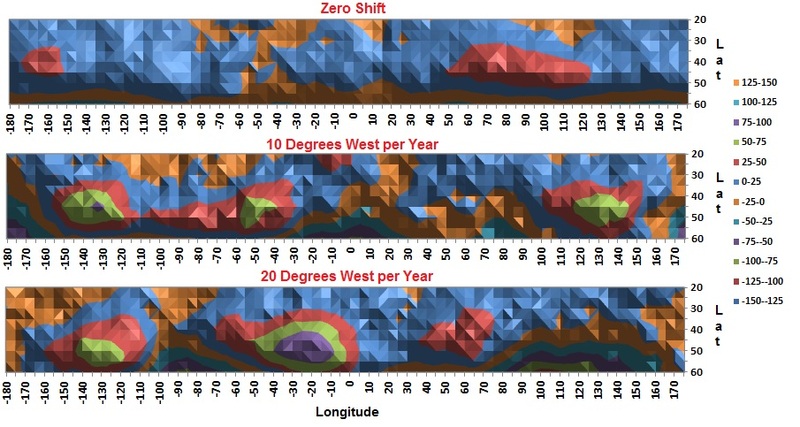 The fact that standing wave-like patterns in the MSLP anomalies and the SST anomalies are both moving around the Earth at the same drift rates and that these drift rates closely match the lengths of the lunar Saros or Draconic cycles, indicates that we are seeing a process where the tidal effects of the lunar Draconic cycle are no longer being reinforced by the lunar Perigee-Syzygy cycle. Fig. (5). The relative power spectral density (PSD) for those features that have an N=4 pattern in the average longitudinal profile for latitudes between 30° and 50° S, for the shift-and-add map of the summer MSLP anomalies, plotted against westerly longitudinal drift rate. N.B. 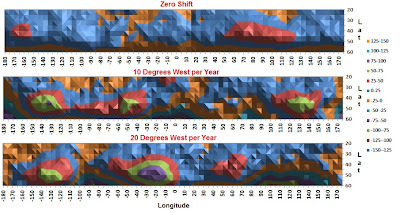 The step in westerly drift rates has been increased to 2.5° per year between 0 and 25° degrees per year for greater resolution. A solid black line drawn across the lower part of this figure indicates the minimum power spectral density that is required to rule out the possibility that the signal is generated by noise at the 0.01 (= 99 %) confidence limit. This limit was obtained by applying the Multi-Taper Method (MTM) (number of tapers =3) to each shift-and-add anomaly profile that is associated with a given drift rate in this diagram. Only those points which had spectral densities that could not be generated by chance from either white noise or AR(1) noise at the 0.01 level were accepted as being statistically significant. All points above the 99 % confidence line in this figure are statistically significant while all the points below this line are not (with the exception of the point with a drift-rate of 50° per year). It is important to note that there are strong, low frequency spatial features present in the individual spatial MSLP anomaly profiles. Under these circumstances, simple spectrogram analysis is not good at determining the true spectra noise levels that are need to test the statistical significance of spectral features. One way to circumvent this problem is to use MTM analysis, since it better able to distinguish strong low frequency signals from spectral noise. Fig. (14). Blue curve: The angle between the line-of-nodes of the lunar orbit and the Earth-Sun line at the time of Perihelion (phi) is plotted as a function 1/(1+ phi) between the years 1857 and 2024, in order to highlight the years in which these two axes are is close alignment. Brown curve: The angle between the line-of-apse of the lunar orbit and the Earth-Sun line at the time of perihelion (psi) plotted as the function - 1/(1+ psi), in order to highlight the years in which these two axes are is close alignment. Red curve: This is an alignment index that is designed to represent the level of reinforcement of the Draconic tidal cycle by the Perigee-Syzygy tidal cycle. This is done by plotting the values of the blue curve at times when there is a close alignment of the line-of-apse and the Earth-Sun line at perihelion (i.e. when psi <= 16°). Fig. (A3a). The map on the right-hand side of Fig. (A3a) displays the cross-correlation functions, for all years from 1971 to 2009, which use the 1964 profile as a template, stacked together to form a map. This map is reproduced on the left-hand side of Fig. 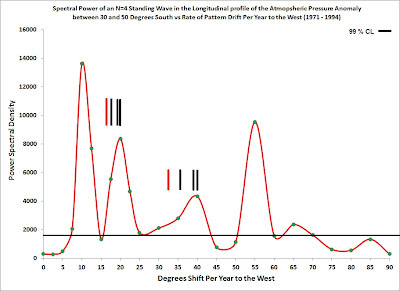 (A3a) to show that the N=4 pattern is moving towards the west over most of the period between 1971 and 1994. Could This Be The Climate Smoking Gun?